As has sort of become a tradition for me (and so many other bloggers – I secretly love reading everyone’s year end reviews and getting a little glimpse into their highs and lows), I wanted to take a little time and a little space here to reflect on last year and look forward to the next. I’ll try to keep it relatively short and sweet, but if you’re just hear for the food (no shame in that), skip down to the end for some delicious Russian-inspired zakuski from our New Year’s Eve festivities. It was a pretty big year for this blog, especially in the last few months. There were a few months where revenue from this space was actually enough to cover my rent (! ), Trevor and I wrote and photographed our first in-print article (I can’t wait to share it with you when it’s published), I worked with a number of great new sponsors and brands, and I created some content I’m pretty proud of. Although sometimes it’s hard to feel progress when you’re working on something day after day, taking a minute to look back at how it has grown over time highlights all the changes. Personally, this year felt mixed. It may be that I’m letting the stress I’ve been feeling for the past two months represent too much of the year, but like any year, 2014 definitely had its highs and lows. I actually ended up having 3 different jobs this year, all with the same company, which was exciting, but not without its transition stress. I traveled a ton – this was certainly my biggest year yet as far as travel is concerned. I made trips to 6 countries – Ecuador, Hong Kong, Canada, Italy, Malaysia and Ireland – and all of them except for Italy were places I’d never been before. I wrote detailed travelogues of my family’s trip to Ecuador (Quito, The Amazon, Baños, and Cotopaxi) and shared some pictures and memories of our over-the-top dinner at Au Pied de Cochon in Montreal, here. 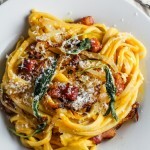 The rest of the trips were for work and were mostly documented through Instagram, but in short: Hong Kong is incredibly vibrant and alive and I would love to spend more time wandering through it’s crowded streets; a long-weekend spent solo in Rome in May is just about the loveliest thing there is, for the unhurried bowls of fresh cacio e pepe eaten al fresco, long runs through the Villa Borghese, and afternoons spent poolside; the best part of Malaysia was undoubtedly the food, which was abundant at every meal and convinced me that I would be perfectly happy eating sweet and creamy curries for breakfast for the rest of my life; if someone asked me to move to Dublin I would be happy to go, for the friendly people, the twisty streets, the lively pubs, and unlimited quantities of amazing Irish butter. Besides travel and blogging, there were a few other things that defined this year for me. I definitely got back into a solid fitness routine over the course of the year, which I documented through these monthly “Fitness Challenge” posts. I started from a place that I was very unhappy with – heavy, tired, and a complete stranger to my old running habits. Getting back in shape was a slow process, but by springtime I was running regularly and eating better, and I managed to keep those habits going all year. And of course, there’s the stuff that really matters – family and friends. I love how much time I was able to spend with my family this year, and being able to drive over for gardening and Sunday dinner almost every week is something I really treasure. I perhaps could have done a little better in prioritizing some of my friendships last year, but it’s something I hope to focus on more in 2015. And finally, Trevor is still the best, I love sharing my life with him, and I love that even after 7 years together I still feel excited to be with him. So that’s a big fat plus sign for 2014. Although I’m still reflecting on how I want to shape 2015, there’s a few things that I already know will be focus areas. One thing that I want for myself is to be less stressed. This is probably easier said than done, but I’m trying to think about what habits and routines I can change to allow myself to be more flexible and less likely to end up in a stressed-out, to-do-list-dominated state. I also want to find ways to build more joy and spontaneity into my life, to be more flexible, and to forgive myself and others more easily. I’ve been toying with the idea of some sort of gratitude journaling or instagram project, to keep myself in a positive and thankful frame of mind, but am a little worried that I’ll turn it in to one more thing I stress out about getting done every day. Have any of you tried something like this? What did you think? On a lighter note, I want to read more books, take better advantage of my travels, have more regular date nights with Trevor, and maybe learn to dance on pointe (I have no idea if this is even within my reach, but I’d like to think it is!). What are your resolutions and thoughts for the new year? I’d love to hear about them. And if you’ve read through all that (not as short-and-sweet as I promised, huh? ), then it’s time for some New Year’s eating! We had a fairly mellow New Year’s that was just right – movies and drinks with my brothers, then Veronika came over for snacks and champagne, before we headed with her and Scott to a late dinner in Harvard complete with fun party hats and free champagne. 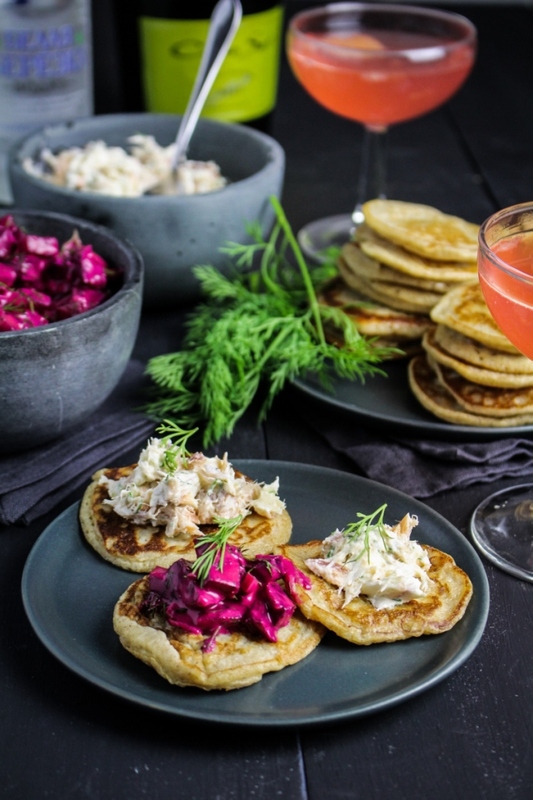 The snacks were sort of a last minute decision, but once I’d gotten the idea of a little Russian-inspired blini spread into my mind, I couldn’t get it out again. 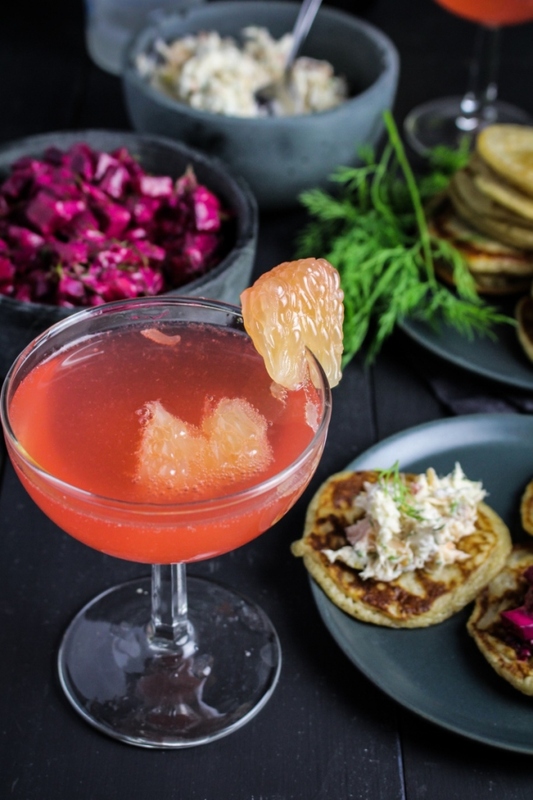 New Year’s Eve is a much bigger holiday in Russia than Christmas is, and the evening is filled with lots of zakuski, a buffet of hot and cold appetizers, and vodka toasts. 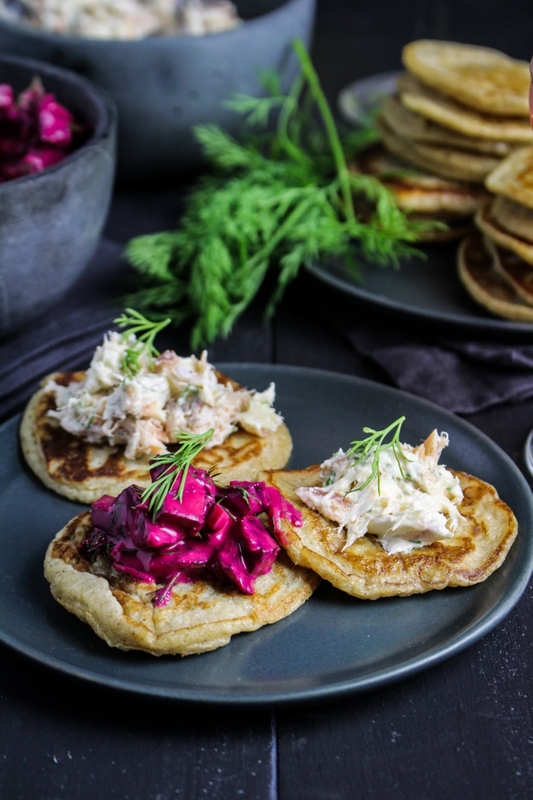 So I whipped up a batch of rye and caraway blini and two easy dips: one made from hot-smoked salmon and cream cheese, and the other from chopped beets, honey, and vinegar. 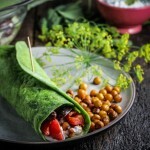 Both got generous helpings of dill and red onion, and spooned onto hot blini for a delightful mix of flavors. For drinks, I went with a sparkly pink number inspired by this Bon Appetit recipe, with fresh grapefruit juice, vodka, campari, and prosecco. Everything was delicious and all together it made for a festive spread. 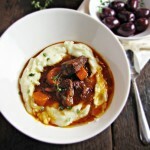 Recipe adapted from Food & Wine. Makes 30-40 blini. Place the buttermilk, both flours, eggs, melted butter, brown sugar, caraway, salt, baking powder, and baking soda in a blender. Blend on high until a smooth batter forms, stopping to scrape excess flour down the sides with a spatula if necessary. 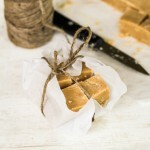 Let batter sit at room temperature for 15 minutes, or in the fridge for at least 30 minutes. When ready to cook the blini, stir the seltzer into the batter. Heat a little canola oil in a large frying pan over medium heat, then pour tablespoon-sized drops of batter into the prepared pan. Cook until bubbles on top of pancake have popped, then flip. They should cook for about 60 seconds on each side. Remove to a plate, and repeat until you have used all the batter, adding more canola oil to the pan whenever it runs out. Best served warm. Beat the cream cheese, creme fraiche, red onion, dill, and meyer lemon together until the mixture is even. Use a fork to flake the hot smoked salmon out of its skin in bite-sized pieces. Gently stir the salmon pieces into the dip. Serve chilled. Recipe inspired by Cooks.com. Makes about 2 cups. Remove the greens and tails from the beets and place the beets in a large saucepan. Cover with water and bring to a boil, boiling until the beets are tender when pierced with a fork, about 25-40 minutes, depending on their size. Remove the beets with a slotted spoon and run under cold water, rubbing the skin off with your hands as you do so. 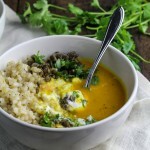 This works best when the beets are still warm. Dice the beets into 1/4 inch cubes. 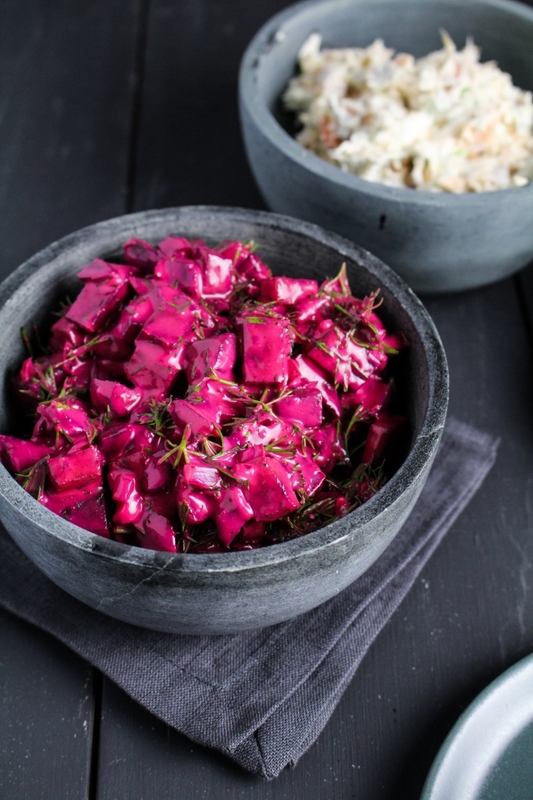 In a medium bowl, stir together the cream cheese, red onion, honey, vinegar, and dill until evenly mixed, then stir in the cubed beets. Season to taste with salt and pepper. Serve cold. Inspired by Bon Appetit. Serves 2. 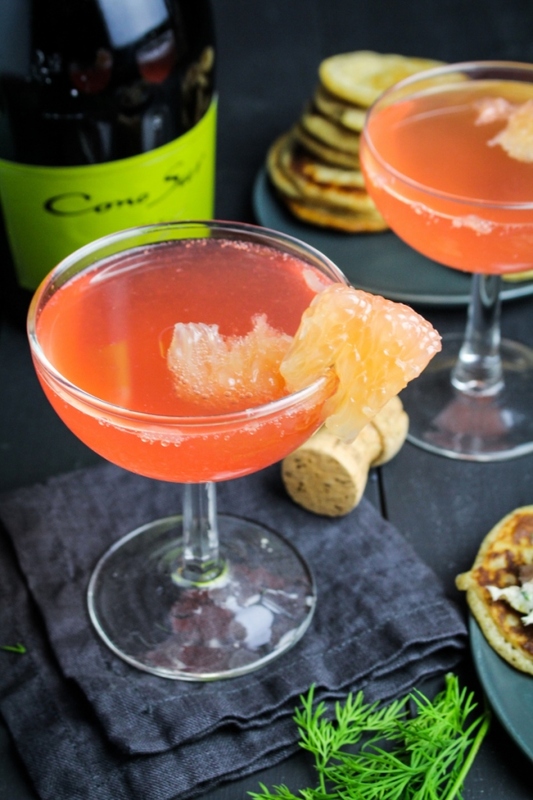 Add grapefruit juice, vodka, and campari to a cocktail shaker with a few cubes of ice. Shake vigorously, then strain into two coupe glasses. Top each glass off with prosecco and serve immediately. 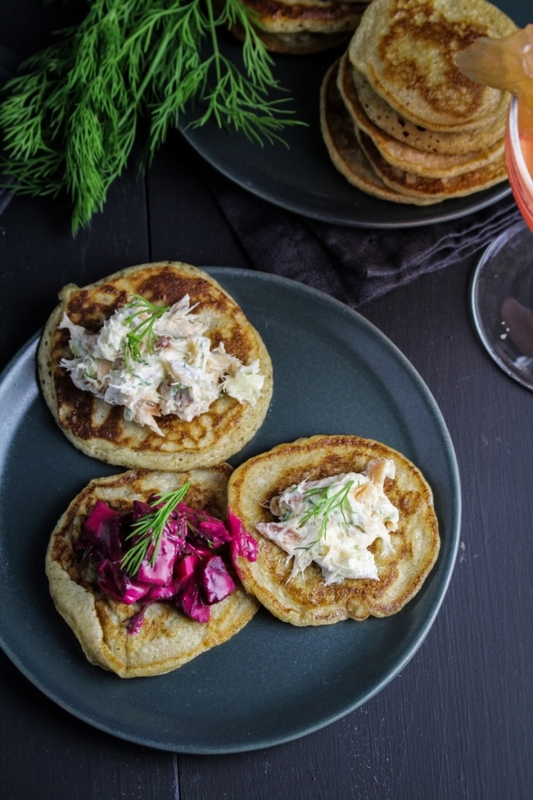 These blini sound seriously amazing! And I love the beet dip. I for one have at least five beets in the crisper right now, so I may end up making a batch very soon! 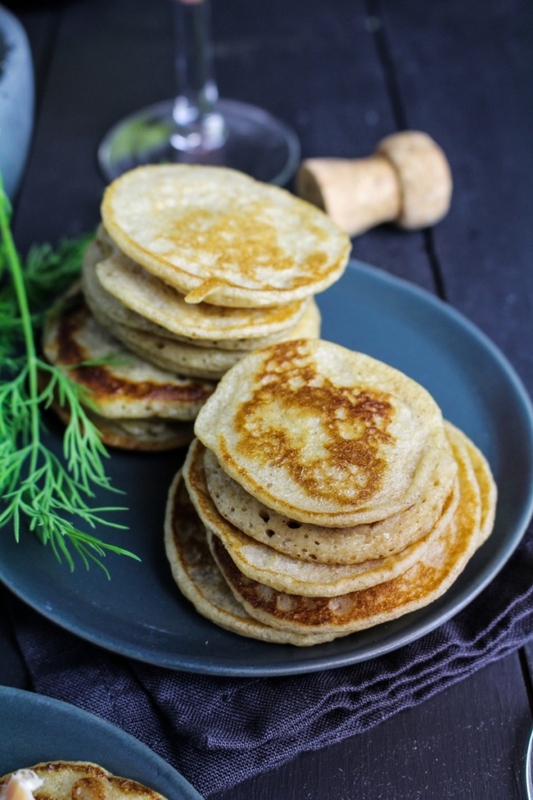 These blini sound wonderful – I love the addition of buttermilk! Happy New Year, Katie! I always enjoy your posts and am looking forward to what 2015 brings! Thank you Ranjani! Good to hear from you. I hope 2015 is good to you, as well! Blini definitely bring back some nostalgia. 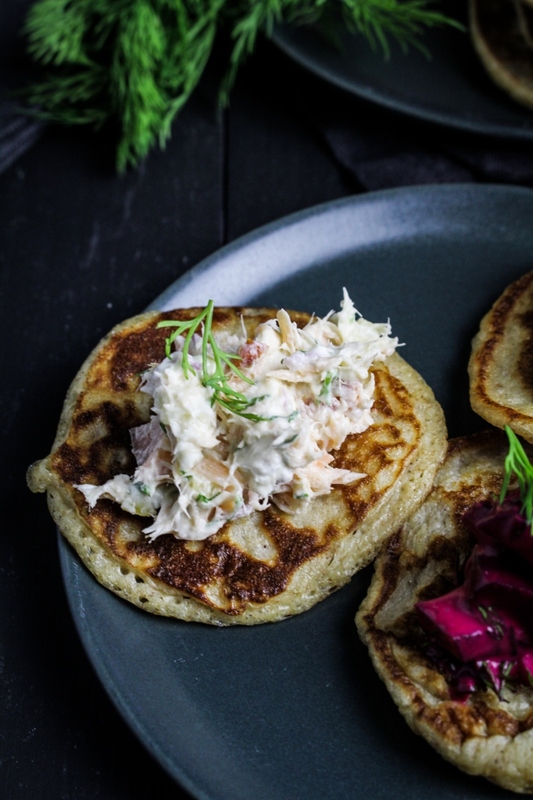 My Russian grandmother used to make salmon and dill blini for me ALL the time. 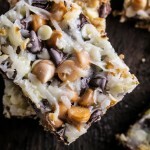 Thanks for reminding me how delicious they are, this is definitely something I need to make soon! This beet dip is like the GREATEST. THING. EVER. Wow, I’m so glad you love it!